Received my new ear-canal headphones today. First thing I noticed was how comfortable they feel. Wow. I'm stoked! This was always the biggest problem with other headphones that are inserted into the ear. Some would make my ears so sore after only 15 or 20 minutes that I could't wait to yank 'em out. Sennheiser uses an extra soft moldable rubber that feels like you're wearing slippers. Over the years, I've tried a dozen different styles of in-ear headphones, and these sound the clearest (by a considerable margin). Listening to a sample of test-songs, I'm hearing things I've never heard before. 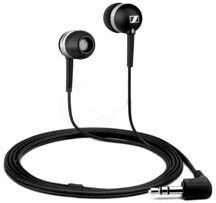 Continue reading Rad Review of Sennheiser CX300-B In-Ear Canal Headphones.